Creative Memories is in bankruptcy and they are winding down the current business. All Creative Memories consultants will be released from their contracts at the end of August and the ordering websites will be shut down. 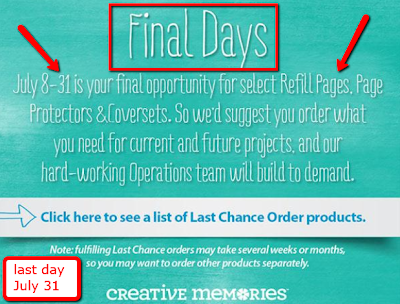 This Wednesday, July 31, 2013 is the last day to order album coversets, pages and protectors and tape runner refills through the Last Chance Order offer. These items will be manufactured to fill the orders and could take weeks or months to ship. You can find the Last Chance Order page HERE on my CM personal website. If you need to order anything I would not wait until the last day as the servers have often been overwhelmed by large sales and you may have trouble placing an order. The Creative Memories albums were one of the main reasons I got involved as a consultant and yes, I will miss them too (I have stocked up a bit for my personal use). The last day to order from my CM personal website is August 21, 2013. Items are available "while supplies last" and some popular items have been sold out. There are still some coverset colors and designs available while supplies last that are not part of the Last Chance Order (but you will not be able to order pages/protectors for these after Wednesday). All Rewards Club, Host and other Product Credits must be used by August 21st. Four of the exclusive Creative Memories Cricut cartridges are still available, Be Young, Divine Wedding, Reminisce Accents and Stork's Delivery. You can find them HERE. Digital Artwork will be available for sale until August 21, 2013. Digital Center orders will be accepted until September 23, 2013. The software programs (Memory Manager and StoryBook Creator) will continue to function but you will not be able to upload projects to the Digital Center for printing after September 23, 2013. You should make sure that your programs are up to date and back up all of your Memory Vaults, Projects and Artwork. Important information including directions on how to backup your digital programs and content are in the complete Frequently Asked Questions (FAQ) document for Digital Software, Artwork and the Digital Center Products which you can download HERE. Please leave any questions in the comments below so that I can answer them for others to see as well. I will be sharing more information as it becomes available (updates or changes). If you have a local consultant, please contact your consultant for ordering and questions. I do have some information about alternatives that I will be using once the current Creative Memories is finished. They plan to launch a new party plan company in November but very little information is available about that right now. I wanted to keep this post short and to the point to be sure that everyone is aware of the deadlines - but I had to add a photo for those of you who are not Creative Memories users. 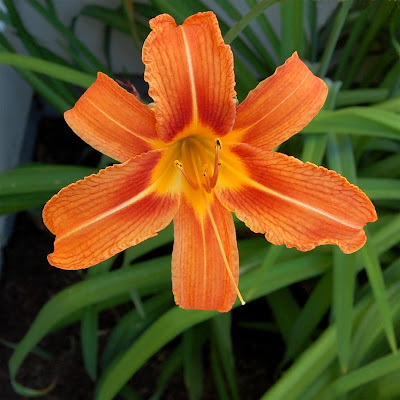 The day lilies are plentiful this year - some of ours grow right next to the garage so I see them everyday. What's blooming in your garden? How many pages typically fit in an album? You can put a maximum of three sets of pages (45 sheets) in an album. I think that with three full sets the albums are difficult to handle and would recommend somewhere between 30 and 40 pages per album. The weight of the pages is important - if you add lots of dimensional embellishments and wallpaper each page with a full sheet of background paper on each side of the page the album will be considerably thicker so you would include fewer pages per album. I'm old school CM and all of my scrapbooking is flat with a lot of the bare page showing. I will check my supply. Thank you so much for keeping us up to date on the CM story. I am happy to try to help even though I am sad about the circumstances. I am curious to see what the "new company" looks like but I doubt that I will join it. I saw that you're officially released at the end of August. Does that mean you have to resign up when the new company opens and start building a whole new team? All consultant contracts with Creative Memories will end on August 31st. The process for joining the new company has not been revealed to us yet. I don't know if people with teams will be able to join as a unit or if it will be a free for all. I am not planning to join the new company at this time. Thanks Diane. I wish you well. I have heard of other products substituting for the CM page protectors. Let me get you some info. I have found some options but I want to assemble a list of possibilities for people who didn't know about or couldn't afford to order during the last chance order period. Any information you can provide will be passed on to my readers. I have been a loyal CM customer sine 1997, and am also sad about what is happening. Will you be sharing information about the alternatives you'll be using in a future post? I have scoured the stores and internet for other options and am interested to know your opinion. Hi Michele, I am sorry that we are losing these great albums and so much more - but we just have to move forward. I will certainly be posting about the options I find and sharing my opinions about alternative sources. I would also welcome input from anyone who has found new sources so if you have some ideas from your searches online I'd love to hear about the things you have found. Thanks!